What can I do to help my irritated shoulder? 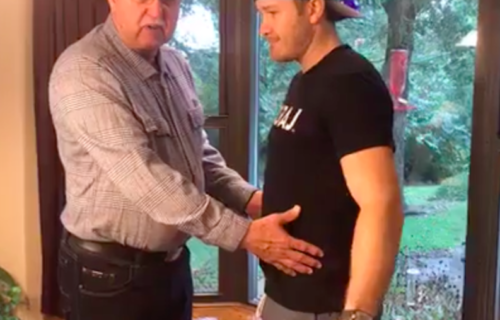 Want to stay on the Health Train with Denison Chiropractic? 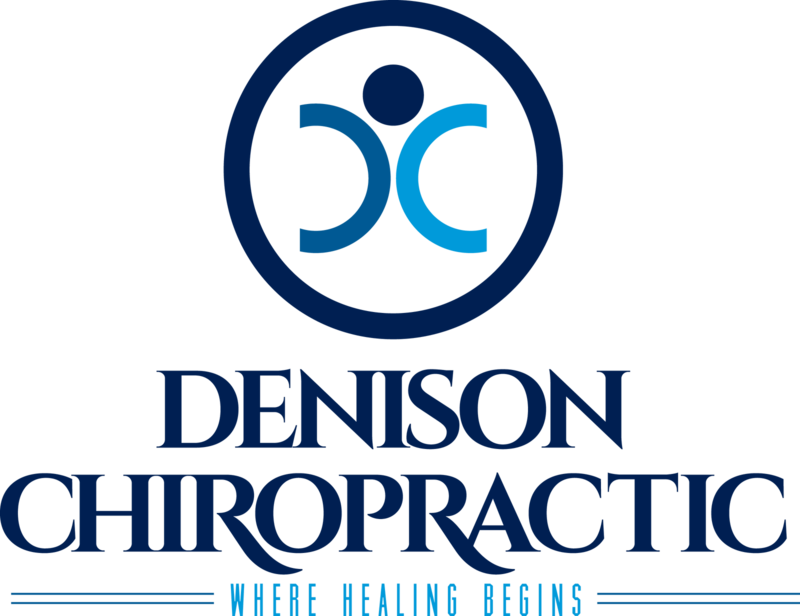 Here is your chance to be part of the Dension Chiropractic newsletter! Listen to Dr Dustin explain some helpful exercises to help relieve shoulder pain. Okay, welcome to my garage. This is where sometimes I get a workout in, or play a little darts or something like that. Anyway, the reason that I’m actually here today is I was talking with a patient, Chris, who has dealt with some shoulder pain recently. He didn’t have a trauma happen, he didn’t have a big strain that he could think of, but he noticed whenever he would bring his arm up very high, it felt like a catch, like a strain was happening. He also noticed it took him a second to get his arm over, which can be pretty common with this irritation, but lifting was difficult. Whenever you’re dealing with a shoulder, there’s a lot of things that can happen. The most common is some mild irritations with the rotator cuff, which is four, different primary muscles that branch into a tendon that wraps and attaches, wraps and attaches, and just brings in stabilization. They’re not the big movers like a deltoid or really even the upper trap, but smaller muscles that if I sleep on my shoulder for a long period of time and then I get up and I go grab something quick, it can feel irritated. I can get little bitty frays in those tendons, not even necessarily a full tear or even a partial tear, just irritations. As long as it’s not one of those things like a partial or a full tear, then there’s a couple of things that you can do with the band to help them. I typically will tell people it’s like prehab. It also can be a protocol for rehab after surgery on a shoulder. It’s pretty common. But if you’ve dealt with shoulder pain and you haven’t had anything big happen, it’s just a really good thing to mix into your protocol to bring in some stabilization to that area, along with ice, flushing out inflammation, [inaudible 00:01:47], turmeric, there’s some different supplements that are really good for inflammation. Anyway, all you got to do is get a band. We have them at the office. You going to get some at academy too. I like the ones with the handles. There’s a number of different movements. I just try and tell people, remember, away from the body and towards the body. In this case, I’m just going to grab a band. I’m going to keep my elbow pinned by my side. I’m going to do high reps, so 10 to 12 reps of twisting my hand out away from the body. So away from the body there, after I do 10 to 12 reps, then I’ll actually turn around and now I’m pulling towards the body. So there’s the way and towards. I’m going to do both of those. Then I can actually step away from the band, pull towards the body. Do 10 to 12 reps here. I can actually now turn around and pull up away from the body, 10 to 12 reps. Then I can face directly towards it, pull towards the body. This one is a little bit different, where this is kind of away. It’s really kind of towards the body, too, but going down and back up and just taking that full circle. Another really good one is this same movement, but with your arm up to the side. So I’m standing here, and go up and go down. 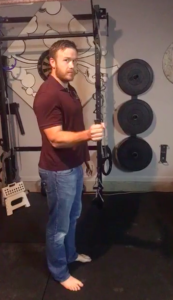 The idea with this is to keep this part of the arm in the same position, and it’s all just that elbow rotation, which actually is a muscle up here that’s working. And the thing to remember whenever you are here by your side, you can sometimes stick something underneath your armpit, underneath that elbow, and the elbow should stay pinned. So if I’m starting to go out and I do this and it falls, then I’m actually moving that part of my body and moving it away. I need that part to be set and tight, so I can step out. As long as I’m going, it’s not a wide range of motion, but as long as I’m going out and it doesn’t drop and I keep that arm pinned, then I’m okay. And another thing to remember is the shoulder blade back here, if it rolls out and forward, that’s bad. I want to have that shoulder blade pulled and tight against my body. So if I actually show you that shoulder blade and what it looks like, you can see sometimes the tip of it bowing out. You want to flatten that shoulder blade against the body, almost like I’m trying to turn my armpit forward. That’s a good, stable position to do these exercises in. I stabilize that joint, I go through, away from the body, towards the body, away from the body, towards the body. Just go through that circle, tighten up that shoulder blade. Takes a few minutes, but you can do it once a day for a few days. I mean, you could do it every day, really, and it wouldn’t be too, too bad if you’re using a light resistance. Help bring in some stabilization, prevent people from shoulder injuries. As always, if you guys have any questions, want me to shoot a video on how to do something or how to get better from something, if I can help you out, I will. Make sure you follow our page, if you like the video, click the like button. Comment, share, all that good stuff. All right. Chris, hope this helped you, and we’ll see you all later. How to help stabilize your lower back before exercising! Why are x-rays needed for chiropractic care?